Hi! I’m Gillian, owner and operator of Pip Robins Accessories, a tiny company with a big heart. I create sewn cowls made primarily from reclaimed textiles, which means I shop for discarded yardage year-round from thrift stores, take them home, give them a good wash and then slowly piece them together. Sourcing these fabrics lowers the environmental impact of having to create new textiles and creates wonderful, limited-edition and one-of-a-kind pieces for both men and women. Cowls are the anti-scarf: a scarf that you easily slip over your head with no looping, tying or wrapping, but offers the same amount of warmth and style as a traditional scarf. Crafting didn’t really come naturally to me. My sister, Ambera Wellmann was always the artist in the family and so it was never something that I focused on. I’m completely self-taught and didn’t know any crafty people until my late twenties. Through the power of internet tutorials and a lot of perseverance I learned some basics and after running Pip Robins for nearly three years I have mastered the art of the cowl. I’m a bit of a vagabond, a wanderer, and spent about ten years travelling and living around the world. I’ve called the Caribbean, West Africa, Mexico and Europe my home, and have lived in a few provinces across Canada. I am a trained Web Developer and that’s what my “career” was focused on for most of my twenties, but I am happy to be out of the IT industry now and focused on my own fashion accessories business. I started Pip Robins after seeing a guy with a bandana over his nose and mouth one bitterly cold day in the North End of Halifax. I loved the look of something pulled up over his face but knew that there had to be a better way to keep warm if you didn’t want to wear a scarf. I worked on a few prototypes and eventually settled on a design and started selling them on Etsy. They took off immediately, much to my delight, and it hasn’t slowed down. I consistently see men’s bare necks in the winter and want to run up to them with my business card and tell them that there is another option! They don’t need to be cold! Let me save you! Women love them too of course, but they’re a lot easier to convince because women often like to wear accessories and they see how diverse cowls are. Pip Robins is my full time job right now. I left my job this summer in part so that I could focus on Pip. I’ve always operated Pip because I love it: I love the treasure hunt and the thrill of finding a really great piece of fabric, I love how it allows me to tap into creativity I didn’t know I had. I love sending my product all over the world (fashion capitals Paris, France and New York, NY are the top international destinations). I love knowing that I’m operating my business ethically and as environmentally as I can. I love working for myself and I love having full control over every aspect of my business and what I send out into the world. I also love the crafting community, the kinship that comes with selling your wares. It makes up for spending so much time alone with a sewing machine and computer. This year I started wholesaling my cowls, so I’m carried in about 20 stores across Canada. In Nova Scotia you can find them at Biscuit General Store, Love, Me Boutique, the lovely little new store Dots and Loops in Lunenburg and Flow Boutique in Amherst. I also have a booth at the Halifax Seaport Market every Saturday where you can find the best selection of cowls in the city. I do most of my business on Etsy and through my own website. This is only my second show; I was involved in last year’s winter show and had amazing feedback and fabulous customers. Halifax Crafters is the only show I’ve ever done or attended! But, as a stickler for money, I LOVE that there is no admission fee. You can attract so many more people of varying backgrounds by not charging a dime to get in. Second, I love that it is volunteer based. I can’t even imagine all of the work that needs to go into organizing this event, so I really appreciate every single person that works their tail off to make it happen. It’s all done for the love of craft, which is totally inspiring and admirable. My easiest source of inspiration is from the fabric itself. As soon as I see something while thrifting I envision it as a cowl and can hardly wait to get it home and start sewing. Once I am finished, I quickly take a few shots of it on myself, put it online and wait for feedback. Who isn’t a sucker for compliments? My favorite website for inspiration is pinterest. So many good ideas, so many images and tutorials I never would have come across any other way. Because Pip is my only job I’ve been able to put a lot more time, effort and creativity into each piece this year, so I’ve started incorporating embellishments like reclaimed leather, studs, wool braids, appliqués and more. This month I was featured in The Coast’s ShopTalk in an article that highlighted my mustache cowls, a fan favorite! 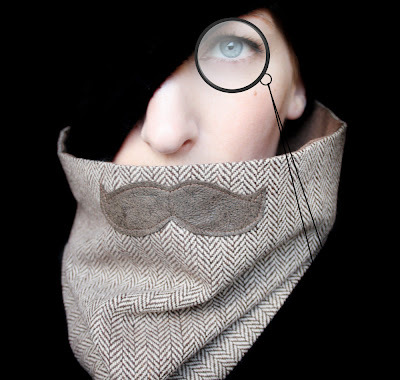 I vow to donate 10% of November mustache cowl sales to prostate cancer research. My industrial Janome sewing machine, Padraig slippers and my chiropractor. Soy chai latte in the morning, a nap in the afternoon, sweet white wine in the evening, loud laughter as often as possible. Gillian Hyde is very talent crafter. 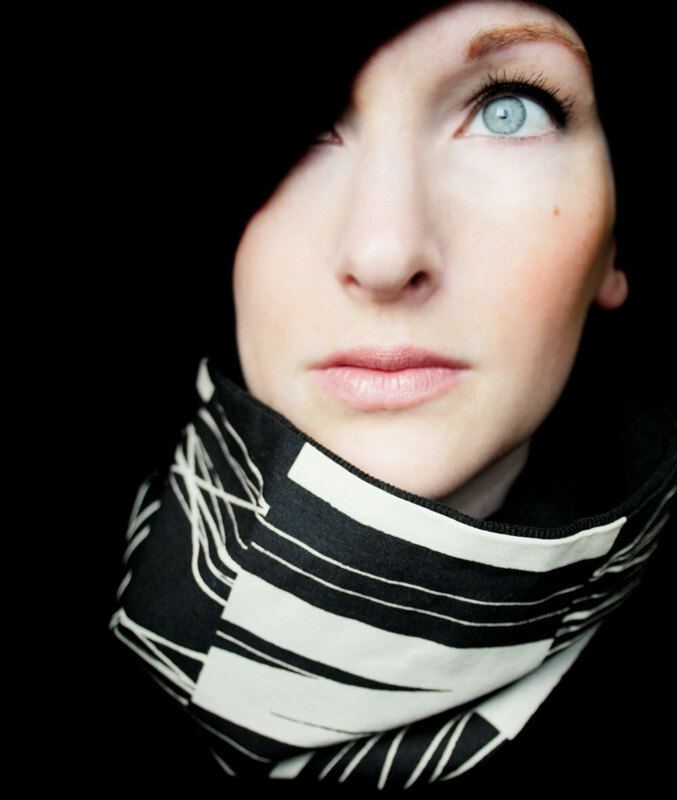 The scarf you make is very unique and of good material. Thanks for sharing all these information with us! 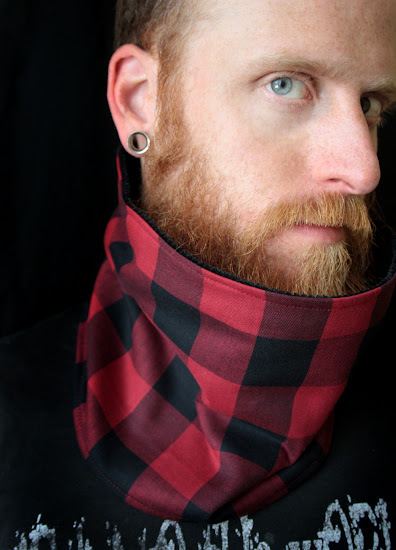 The scarf you make is very unique and of good material. i like it! Just wanna tell you that I enjoyed your blog! Keep blogging such delightable posts!